Finding your style of Patio Fire Pit Design Ideas will depend on your space and decor. Have a wood or composite deck, you will need to get a gas fire pit for safety. 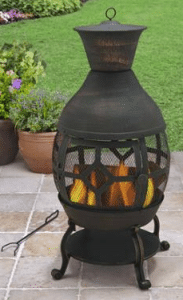 A wood burner can be used on a grass, bare ground, concrete or paver stone surface. Matching your decor will be another factor. If you have a stone wall or pavers, you may want the stone look. If you have a rustic look, maybe a chiminea will work best for you. Looking to cook on your fire pit, make sure that it has a stainless cooking grate that is easy to access. Some of the chimineas have cooking grates, they are just not handy to have a small door that you have to open to turn your meat. Finding your style will be your first decision. Many choices for you here and only you will be able to decide. I will give you some choices to look at, then give you some of the details of each style to help in your decision. I have an all steel fire pit that has given me many years of service. With the proper protection they can last over 10 years before the bottom will burn out. Many styles and looks can be had with a steel fire pit. Choose your favorite Collage fire pit for those tailgate parties in the fall to cheer on your favorite university can be purchased online. For more information on a Collage designed fire pit use this link to my article. Square, round, rectangle designs are also available. Small portable models will give you the ability to move it any where you need a fire. Because of the steel structure, almost any design is available. I have written several articles on wood burning fire pits, look at some my details in my article just follow this link. Having a decorative tile top will give you some design possibilities. Most tile tops have individual tile inserts. You can change color or replace one if broken. If you have one with a solid tile top, they will be harder to replace or change decor color. I would look at the models like the Axxon Alhambra fire pit shown in the picture to the right, look for more information in an article here. 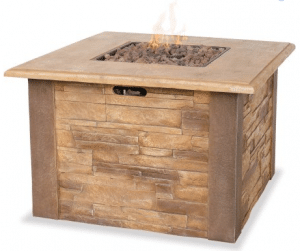 If you have a stone patio or wall in your outdoor space, you may want to look at one of the stone looking wood burning fire pits. Simple ones will be cast in one piece and only need to set up and insert the steel bowl. Different color choices will be available for the stone, this will allow you to match your current stone decor. The big advantage to the cast stone fire pit is its portability. Take out the steel burner, and most will have handle holes to carry from one location to another, just grab a friend and when its cool just move it any where you want a fire. For more of my information on the Sun Cast stone fire pits follow this link. The second way to get the stone look is to use paver stones and stack them in a circle or square type of pattern. Steel inserts are available for these in several sizes and shapes. The cost of this type is much more than the cast ones and you cannot move them without a lot of work. This is a taller style of fire pit. Most will take smaller wood and give a good amount of heat in all directions. Most will come with some kind of grate to cook food on while you are enjoying your fire. Most are made of a steel material and can be made in most any style. They have a door on one side for adding wood while you are burning. See some more styles of chimineas in my post here. You will find many styles to choose from. 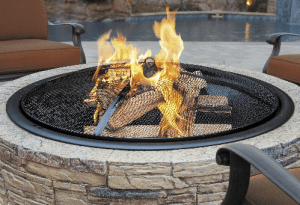 If you have a wood or composite deck, a gas burning fire pit will work the best. You can use a wood burner with a deck protec system, you can see my details here. If would cost less just to get a gas model in my opinion. The gas steel fire pits can be most useful as most will come with a top for the burn area. This will serve two purposes. One will be to protect your burner when not in use. Sometimes debris will get into the holes in the burner making it hard to light or stay lit. Two will be having a smooth top for making it a table when no fire is needed. 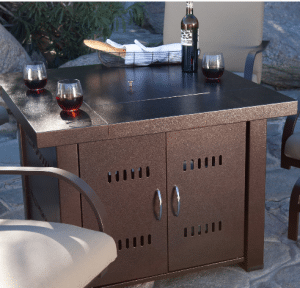 This will be useful in that you will not have to have extra furniture in your outdoor space. The clean lines of most gas fire pits will make them more attractive to those who want more style in their patio areas. For more information on gas fire pits with a table follow this link. The stone look is mostly in cast models for gas fire pits. As they will not have to hold back heat from the fire, they do not weigh as much as a wood burning stone fire pit. Just a facial of stone look and a stainless steel fire bowl. You will have a door on one wide that will give you access to the propane tank and controls. Having glass rocks in the burn bowl will give the expensive look of a much higher priced fire pit. Changing the color form time to time will give you a different look for under $40. Check will each fire pit for details if it comes with lava rocks, as some do not recommend glass rocks. for a substitute. 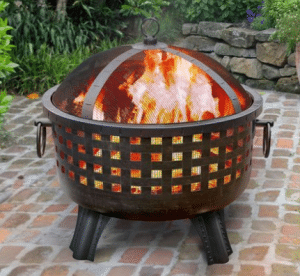 I have had a steel fire pit for many years with out much trouble. The plastic cover has been replace a couple of times. It is starting to pit on the bottom, I will replace it soon. What will I choose, I like the look and ability to move the steel wood burner. I think this time I will get one with a deeper bowl and a cooking grill. What do your think will be the best for you. Use the forms below to give me your thoughts and pictures on your patio fire pit designs so I can share them with my readers. Each person will have different results. I grew up with a firepit always in the backyard. Currently I have an all steel one that has a bowl as the main part where the fire goes (kind of like your last picture in the post). I really like the stone style one. Where would I find something like this? The Sun Cast stone fire place is a great style for those who have spaces that are used for several purposes. I will leave you a link to my post where I have more information on this product. Follow this link for more information. Amazing article on fire pit designs. Unfortunately, I don’t have the space to put any of those considering I live in an apartment. But if I move to house one day, I would love to get a hold of Tile Top, it’s my favorite. You can still use a small gas fire pit on a balcony if you have one. Table top fire pits are available is you really have a small space. 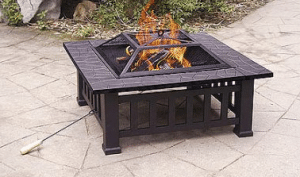 See my information gas table top fire pits in my post here. I heard of barbeque pit but I had no idea on firepit until I read your article. I like Chiminea which looks very fancy and good. I get to know we can use firepit as barbeque pit. Is that true? Can we use it as barbeque? Some Chiminea’s will come with a cooking grate that you can cook on. Using it for a full time BBQ pit will take a lot of work, as most will only have a small door to use to turn your food. Look for one with a large door and fat middle, these will be the best for cooking on. Thanks for the great information. I have been planning on adding a firepit of some type since I have moved into a new house. My original plan was to make a paver patio and then include a firepit with it. The cost was getting too high, so I haven’t done anything. 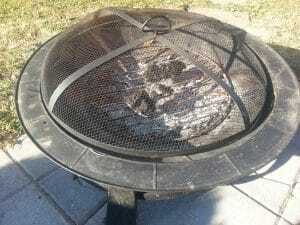 My next choice was to go with the freestanding steel firepit similiar to the one you are showing. I like that it can be moved around. Is it safe to stand that on grass, or do you recommend some solid surface under it? I wasn’t aware that I could get an all in one stone firepit that is already for use, just add insert. I do like that style also, since it is close to what I was planning, but I am thinking a lot less expensive. You can use most wood burners on grass, it will leave a bald spot when it is moved. I have used mine in the grass without any trouble. The stone look is a great decor idea for most outdoor spaces. Love all your valuable information you’ve done all my work for me.Except for choosing and I like the stone look. Look awesome in pictures. Like a stone mason just made. And Ilike you can get it in different colors. We have a smoker/grill in the heavy steel and have been thinking about a fire pit. We will be discussing in the near future different options this is very helpful. Thank you for this article. Thanks for reading my article. The stone fire pit will be a great addition to any outdoor space. It is very mobile and will look great. I really like the stone look gas fire pit. I like the look, and I like the fact that I can use propane instead of using wood. I don’t see a link for this particular fire pit? Did I miss it? I have not written any further information on this gas fire pit. I will try to get that information out by the weekend to give you all of the details. I will leave a link when I get it done.